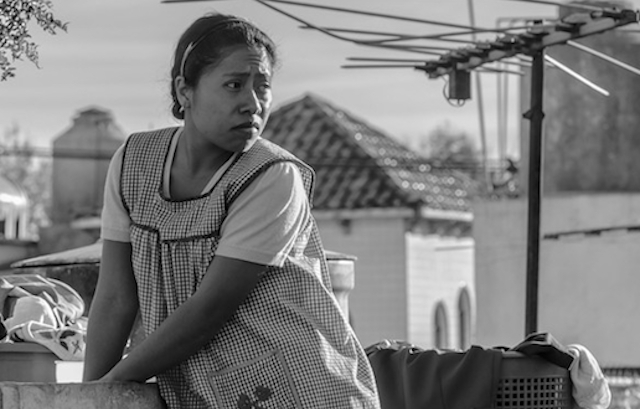 The events of the film takes place in 1970 and ’71 in the Mexico City neighborhood of Roma, as Cleo (Yalitza Aparico) is a domestic maid in the home of Sofia (Marina de Tavira) and Antonio (Fernando Grediaga), plus their four young children. Sofia and Antonio’s marriage is on the skids, but the matriarch tries to hide it from the kids and the rest of the household. Cleo has a burgeoning relationship with Fermin (Jorge Antonio Guerrero), and gets pregnant by him. He runs away after hearing the news, and refuses to acknowledge his role in the expectancy. Cleo brings the baby to term, and her water breaks while street violence is occurring. The circumstances of the birth will haunt Cleo and the family going forward. The situation falls into the life-is-what-happens-when-you’re-busy-making-other-plans category, and much of that life is beyond the sensibility of what should be. The marriage should be solid, the relationships should be loyal and the streets should be peaceful, but then life happens and the characters have to happen along with it. Yalitiza Aparico is rock solid as the center character and understated Cleo, having to both interpret the socio-economic position of a maid and the inner problems of that persona, and confront both at the same time. The other woman in the film is Marina de Tavira’s Sofia, and her performance is remarkable in a different way. She has to hold the household down while her husband strays, and deal with the lead weight of suddenly being on her own. The actor and the story allow the initial strain to crush her, but slowly she rises above the breakdown, in the realization that she must care for her children, and authentically reinvent herself. The film, rendered in glorious black&white, is a cinematic dreamscape of street scenes, country life and even a fire (one of the more surrealistic moments). It all looks achingly lovely even in its desperation, and the cinematography – also by Cuarón – shimmers around the humanity. The director focuses on close ups of images, which become metaphors for the story. The reflection of a jet plane, for example, theorized on the possibilities of escape. This is classic and accessible cinema, an experience to undertake, which reflects the human struggle back to a common empathy. 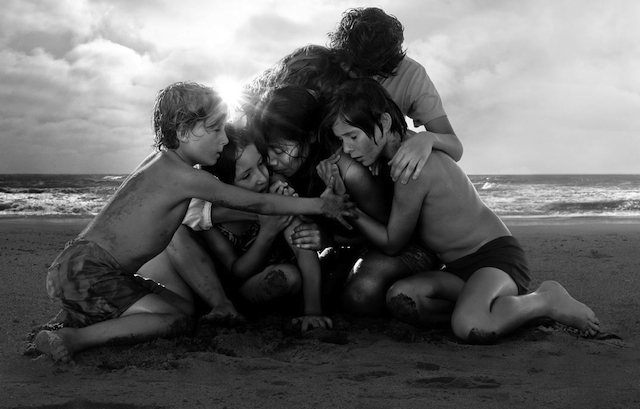 “Roma” is an important film in that assignment, because it dares to keep sparking our feelings, until like the forest fire illuminated, it burns wholly and simultaneously.